This is the verdict on Glasgow's takeaway food options. Edinburgh takeaways are covered in a separate article. Takeaways are a bit like radio stations - you tend to stick to your regular favourites, for better or worse. Occasionally you'll surf the frequencies for something different, knowing that somewhere out there some good stuff exists, but it can feel like a bit of lottery finding it. It's a useful thing to know the local takeaways you should be tuning into. You may already know a few already, but what else is out there? To set about reviewing the best takeaways in town we decided to go for a Big Takeaway. One night, one venue, 50 meals from 25 different operations. We put together a team of reviewers, invited a photographer along, cracked open a few beers, got on the phone and started ordering. The drivers came from near and far, reviewers arrived toting bags of steaming food, we tasted and compared and debated and got sticky fingerprints over the menus. When it was all done, dusted, digested and put into the correct recycling bins we pulled together the reviews, hitlists and tiplists. Across Glasgow there are hundreds of takeaway operations. We tried to pick out the places that offered the best takeaway service and the best food, taking into consideration both established restaurants and takeaway-only operations. Given that one of the great benefits of buying a takeaway is that hot food arrives on your doorstep, we gave priority to places that delivered, but we also covered some venues that only offered collection options. For this round-up we decided not to cover places focused on food that's generally taken away at lunchtime (soup and sandwiches, baked potatoes), or street food, as that's generally designed to be eaten on the street rather than at home. We also chose not to cover fish & chips: there are only a handful of delivery services for these, and it's not a meal that travels particularly well. For a genre that's so popular, the recurring message from our reviewers was that the standard of takeaway food across Glasgow isn't particularly high. Most enthusiasm was generated by takeaway operations offering something different – African or Malaysian food, for example, or those places making a clear effort to present clean tasting, healthy food. In this vein a few sushi venues are offering their speciality at prices that compare favourably with traditional Indian or Chinese carry outs. Alongside the mediocre quality of the food, our hopes were rarely buoyed by looking at yet another long, uninspiring menus filled with the usual suspects. 'Chef's specialities' would often compete in number with regular dishes, and even if you were a regular it could take a long time, and as many misses as hits, to home in on food you'd be confident ordering time after time. The gradual spread of online ordering is a welcome trend (while it works); even in the course of our carefully planned Big Takeaway various orders and delivery arrangements came unstuck trying to cross language barriers. Some delivery operations have got their act together, and are winning custom for it. In the end, many of us find it more reliable to walk down to the best of the local restaurants to collect, though even here not all food travels well. Noodles and anything deep fried are particularly susceptible to sweat unpleasantly if left for any length of time in a takeaway box or bag. Not all takeaways are rubbish, but we're increasingly aware of how much rubbish they generate. 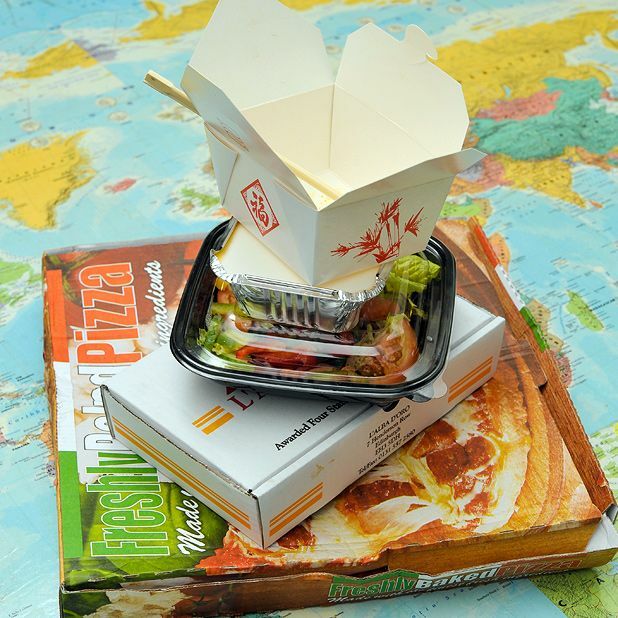 The right packaging can help food travel and look better, as well as stay warm, but the sheer volume of cardboard, foil, paper and plastic used by the takeaway industry is startling. There was little evidence of recycled or compostable packaging among the venues we covered. As it was, we just tried to avoid catching the eye of the bin-man the morning after the Big Takeaway. Open: Mon–Sun noon–10pm Delivery: Mon–Sun 6pm–10pm. Free over £15. With a wide selection of great value and unusual dishes from the Tamil Nadu and Kerala regions, the Banana Leaf provides a takeaway with a difference, and a great opportunity to sample traditional and authentic South Indian dishes that are rarely seen on westernised curry menus. Particularly popular are the dosas – rice pancakes stuffed with a variety of fillings including cheese, vegetables or semolina. Masala tawa fried fish – charred flavoursome moist bites of salmon, set up the palate ready for a substantial main of lamb with deep and earthy chettinadu spices. A wide selection of meat-free options makes this a good place for veggies and the competitive prices make the Banana Leaf a real pocket-pleaser. Open: Tue–Sun 4.30–10pm. Closed Mon. Delivery: to G2, G3, G4, G11, G12. Min order £7; delivery charge £1.50. It seems fitting that the ‘BKK’ in BKK Thai stands for Bangkok – a very Thai city with a Western influence – as the food from this small Finnieston takeaway is similar to that served in the better tourist joints in the hot, bustling capital: packed full of fragrant aromas and delicious flavours. The Thai green curry has a genuine slow burn that impacts after three mouthfuls. If you can handle the heat, it’s fantastic: spicy, sweet and full of fresh, zingy aromas. Big plump king prawns dominate the sticky, sweet pad Thai – a far cry from the hot-plate street-food found in Bangkok. There are lots of other tasty morsels worth investing in: crispy chicken wontons, steamed pork and chive dumplings or tasty little Thai style crackers – all delicious. Delivery: to G11, G12, G20, G3, G14. Charge £1.50. Will also deliver alcohol. Seconds from Hillhead Underground, Masala Twist adds a splash of colour to an already vibrant area with it’s flamboyant doorman dressed in traditional Indian finery. This fun touch is typical of this hitlisted restaurant and is further demonstrated throughout its takeaway offerings, which as well as the usuals includes many tasty ‘twists’ using Scottish ingredients. Haggis pakoras, are dense and spiced, while from Rajasthan zyakedar hiran uses earthy chunks of venison to good effect in an aromatic curry. There can’t be many Indians in town boasting junglee khargosh, rabbit curry, as well as an impressive selection of regional dishes from Lucknow, Maharashtra, South India and Goa. Amusingly, there’s still space for the Glaswegian specialty of curried mince and tatties. Delivery: Delivery 6pm–11.30pm to two-mile radius. Min. order £10; £1.50 charge. For delivery or for a very late night carryout, Hong Kong Express does the classic Chinese dishes, but it also offers a broad range of less-familiar specialties that are certainly worth trying. Fine green beans with minced pork is served without a sauce, delicately spiced with slices of ginger throughout, with sweet well-cooked beans contrasting with the soft, savoury pork. Beef with green pepper and black bean sauce is also good, with strips of tender meat and earthy beans retaining some of their firmness, and all the vegetables have a satisfying crunch. For the more adventurous, and also for those who like to play it a little safer, Hong Kong Express offers quality Asian food with plenty of distinctive flavours. Nestling opposite Kelvingrove Gallery, the Little Café has been offering its pizza, deli, and coffee wares for around three years but has only recently begun offering a delivery service. From Monday to Saturday you can order up one of their delicious thin-based pizzas, though on Sundays its collection only – offering the chance of a stroll in the park to the café itself to take one home with you. If the bases are good, the toppings are of the same quality, and the café’s deli leanings mean that you can munch on the sumptuous pastrami and rocket combo. If you’re looking for some additional greenery, then their Mediterranean salad is a fresh and tasty treat. Classic Punjabi dishes alongside some South Indian and even Himalayan dishes, including Ashoka’s delicious lamb desi. Catering for the post-pub, post-party or just stumbled out of a club crowd, Balti Club is top of the speed dial if you want, or perhaps need, a vat of curry, 12-inch meat feast and two litres of Irn Bru delivered at 4am. A selection of great value and unusual dishes from the Tamil Nadu and Kerala regions. Their dosas are particularly popular . BKK's Thai green curry has a genuine slow burn that's spicy, sweet and full of fresh, zingy aromas. There are lots of other tasty morsels worth investing in: crispy chicken wontons, steamed pork and chive dumplings or tasty little Thai style crackers. Quality curries bolstered by grill options from kebabs to peri-peri chicken, as well as pizzas, burgers and baked tatties. A packed menu and a commitment to fresh and healthy eating from miso soup to chicken dumplings and neat sushi arrangements. An all-rounder with a reliable and diverse menu featuring pastas, burgers, hot dogs and baked potatoes, with pizzas a speciality. Options include excellent hot curries, tandoori and kebabs, through to tapas thali, stone-baked pizzas and even healthy light bites. No delivery. Succulent mains, tender vegetables, interesting textures and freshly prepared steamed dim sum. Among the tastiest Indian takeaway and delivery services in the West End – fresh ingredients dominate with dishes cooked to order. A chip off the highly respected Mother India block with a takeaway and small deli counter with ingredients for home cooking. No delivery. A straightforward noodle bar, offering satisfyingly healthy-feeling and fresh-tasting bowls of soups, rice, bento boxes, sushi, teriyaki, tempura and kushiyaki. From Monday to Saturday you can order up one of their delicious thin-based pizzas, though on Sundays its collection only. If the bases are good, the toppings are of the same quality thanks to the café’s deli leanings. A takeaway menu offering pasta, salads and hot focaccia, but the star here is the pizza. No delivery. There can’t be many Indians in town boasting junglee khargosh, rabbit curry, as well as an impressive selection of regional dishes from Lucknow, Maharashtra, South India and Goa. Thick, fresh bases and mounds of juicy, chunky toppings, including some bold and addictive flavours. The strength of this African restaurant cis in unusual ingredients and spices such as goat, coconut chicken stew and spicy rice. One of the city's few South Indian restaurants, it isn’t cheap by carryout standards, and they don't deliver, but it’s high-end stuff. Specialising in North Indian fare all meals have to be collected – though it's a journey well rewarded. A diverse Tuscan/Ligurian menu that loses nothing in transit. Pizzas are the obvious choice here but fresh pasta dishes are equally balanced and full of flavour. For delivery or for a very late night carryout, Hong Kong Express does the classic Chinese dishes, but the more adventurous will discover quality Asian food with plenty of distinctive flavours. Hefty but tasty burritos come with one of the four quality salsas. Other options include tacos and nachos in different meat or veg combos. And it's licensed, though there's no delivery option. Big fat burritos at good value from a brief but tasty takeaway menu with online ordering and delivery to G1–G5 postcodes. Super crispy, light pizzas made with a low-salt, high-health home-made dough and tomato sauce, cooked in a wood-fired oven. Traditional on-the-bone curries such as karahi and nehari offer tantalising Punjabi flavours, while the spit-roasted baby chicken is a show-stealer. Look for the unusual salmon tandoori, tandoori lamb chops with fresh coriander and a reasonable vegetarian selection. An enticing alternative to the usual takeaway options thanks to its desi-style home-cooking with a Pakistani rather than Punjabi influence. No delivery.